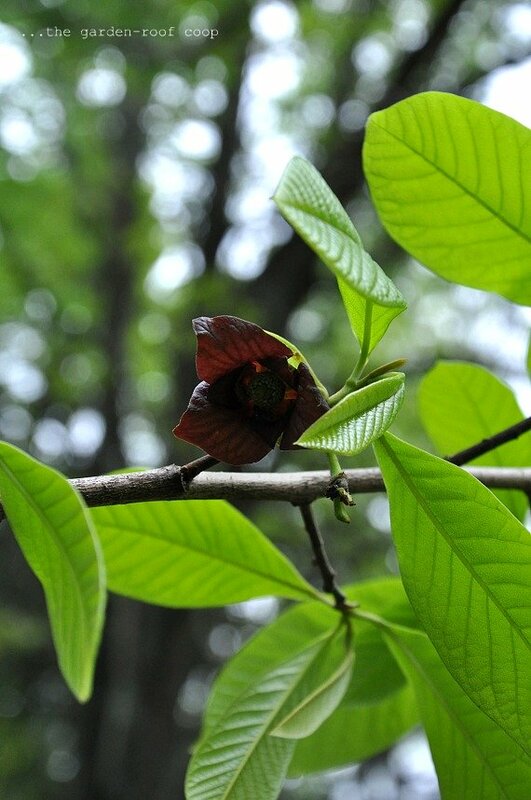 Asimina triloba 'Pawpaw' is a Missouri native small understory tree or large shrub which typically grows 15-20' tall (sometimes to 30') and occurs in low bottom woods, wooded slopes, ravines and along streams. Cup-shaped, purple flowers appear in spring, and give way to edible, oblong, yellowish green fruits which mature in early autumn to a dark brown. Flavor and fleshy consistency of the sweet-flavored fruits resembles bananas. 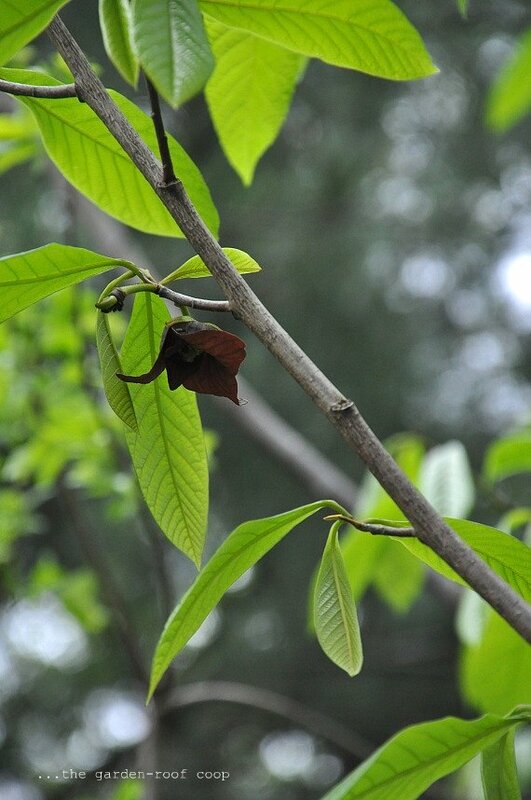 The leaves of the pawpaw trees are also the host plant of the zebra swallowtail butterfly. Last year I followed one of these fast moving, reclusive butterflies and watched her lay eggs on the leaves of a small tree.--I discovered that I had a mature group of pawpaw trees that just happened to be right next to the chicken coop! This isn't the first Missouri native plant-tree-flower that I have purchased only to find growing in the wild on my property! For more info and photography of wildflowers, visit Clay and Limestone's celebration of wildflowers the 4th Wednesday of each month. Oh my goodness, a Pawpaw tree! I have so many memories of eating this delicious fruit when I was growing up and living in Houston, Mo.! 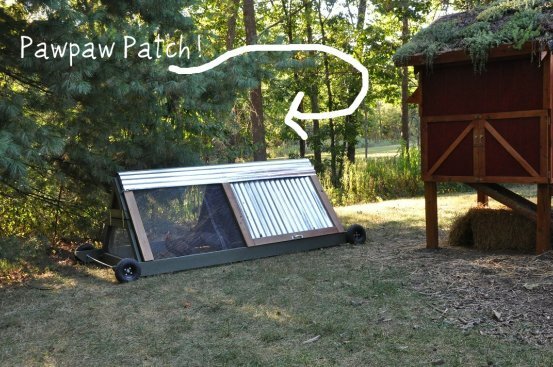 I have wanted to plant one in our yard here in Tn., but not sure if they would grow very well or where to buy one. That is certainly one beautiful butterfly, so glad it likes the Pawpaw tree! 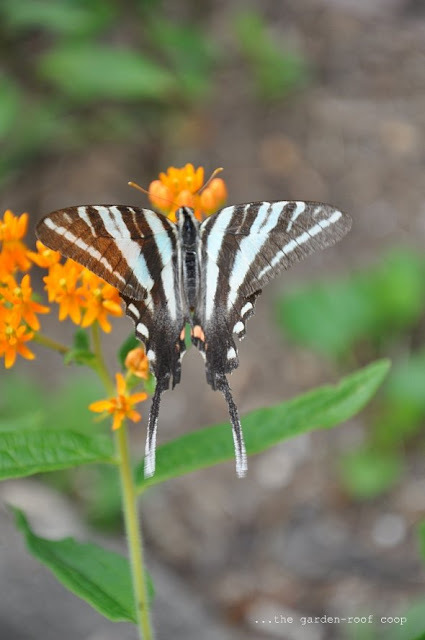 I spotted a zebra swallowtail in my garden two years ago. This year I have seen several. I must have paw paw trees somewhere close by in the wooded lots behind me. But, I do have it on my list of trees to get just for these beautiful butterflies. I hope you find some caterpillars on your trees! 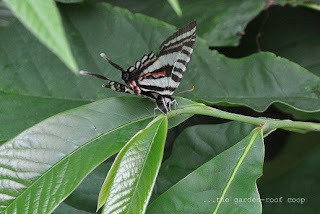 Karin--maybe you should follow one of the swallowtails to the trees like I did! I was so excited to discover the trees...and they are so close to my house. I didn't even have to go "way down yonder" to the pawpaw patch! I wonder what your little trees would need to grow? Potassium? Phosphorus? That's so strange. I love the photo of the butterfly on the orange flower - it's beautiful! That orangey yellow is one of my favorite colors. 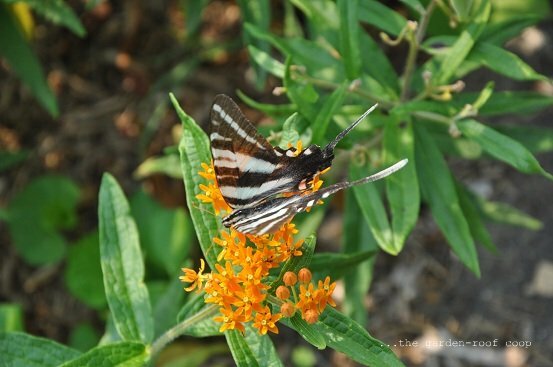 How lucky you are to have the gorgeous Zebra Butterflies visiting your little pawpaw trees! Stunning images featured in this wonderful post! Mom, aged 93, always talks about paw paw trees she knew in her native Arkansas. She has planted several without success in TX. I'm not sure I've ever seen one. Very interesting. I have a sister living in Missouri. I'll have to tell her about the PawPaw trees. Thanks for following that butterfly. Good shots of a lovely butterfly.